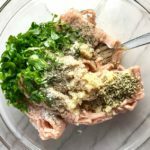 My lighter version is still made with gluten-free crust, but rather than the higher fat and calorie pork sausage, THE LIGHTER VERSION is made with ground turkey that you turn into homemade Italian Sausage! 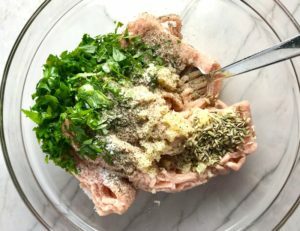 This homemade turkey Italian sausage will save you 11g of Fat, 5g of Saturated Fat, 11mg Cholesterol, and 94 calories! And, I am dead serious, it tastes delicious – I could not believe how great it tastes! 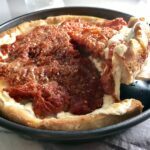 For those of you that haven’t read the original pizza post, I grew up in a suburb of Chicago and we would frequently go out for Chicago-Style pizza, which I absolutely LOVE. Chicago-style means deep dish pizza that has loads of gooey cheese, topped with a layer of salty and herbed sweet Italian sausage, topped with bright and fresh tomatoes and a sprinkle of parmesan. I respect the thin crust pizza and frankly, I don’t discriminate, I love all types of pizza. However, Chicago-Style is by far and away my absolute favorite. Start by making the Italian Sausage. 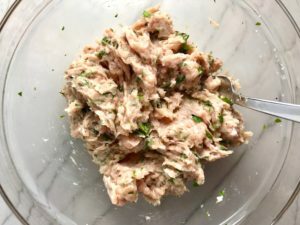 Add the minced garlic, chopped parsley, fennel seed, salt and fresh ground pepper to a bowl and mix with a fork until everything is completely combined. See below for detailed recipe. Set aside until ready to layer on top of the mozzarella. For the dough, I once again used Wholly Wholesome Gluten-Free Pizza Dough. 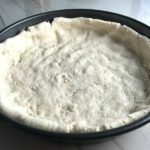 This dough is perfect for this pizza because you need a dough that is pliable enough to spread up the sides of the pan and this delicious dough does just that and bakes up perfectly – crispy in just the right places and soft in just the right places. I buy this dough from Fresh Direct but use whatever brand you can find at your local store. BTW, just a side note, to say that Fresh Direct has single-handedly CHANGED MY LIFE! I no longer have to go to the grocery store multiple times per week or spend hours there on a Saturday wishing I was with my family! To check out, click the offer here: Exclusive Offer For New Members! Save $25 On Your First TWO Orders Of $99 Or More When You Use Code FD25OFF at FreshDirect.com! 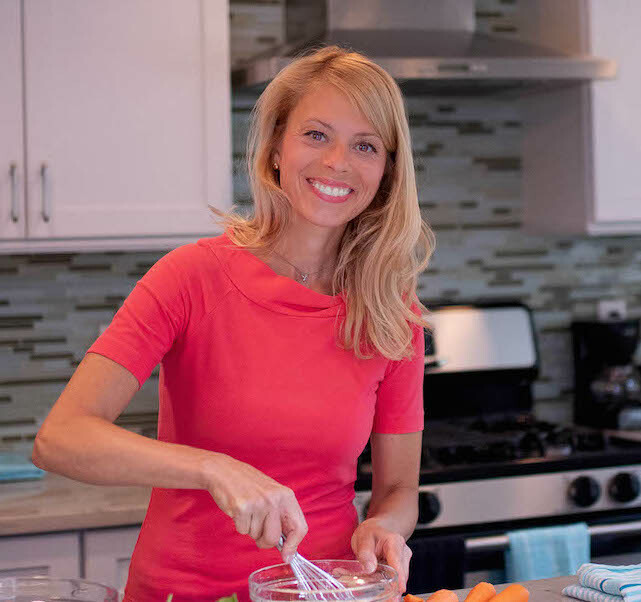 After coating an 8-9″ round pan with Extra Virgin Olive Oil, place the dough in the center of the pan and press it out to cover the bottom and then up the sides, making sure to pinch any holes back together. The first layer that goes on the bottom of this amazing Chicago Style Pizza is the cheese – Mozzarella Cheese. TIP: Fresh mozzarella has more moisture than processed shredded mozzarella, therefore, the best way to avoid this moisture from oozing out into the pizza is to slice the mozzarella 1+ hours ahead (you can do this the night before) and lay it layered in paper towels to soak up the excess moisture. Layer the de-moisturized mozzarella all over the bottom. Next, layer the turkey Italian Sausage. 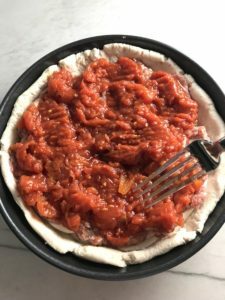 The final layer to go on top is the tomato layer, which is very simply San Marzano whole peeled tomatoes that you mash in your hands and go on the pizza a little chunky. 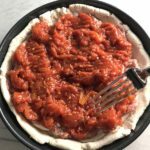 Place a strainer over a bowl and squeeze and mash the whole tomatoes in your hands and make sure that you really strain the liquid out so that it doesn’t make the pizza soggy. Spread the tomatoes all over the sausage. Sprinkle grated parmesan cheese on top and bake in a 450 degree oven for 30-35 minutes until the crust is golden brown. Let sit for 5 minutes. 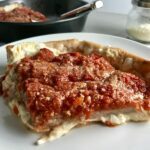 This Chicago Style Pizza is a lighter and healthier version, but still AMAZING! 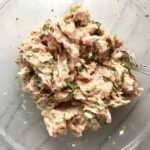 It still has all of the gooey mozzarella cheese, but instead of high fat and calorie pork sausage, this recipe uses homemade turkey Italian Sausage. This sausage is easy and unbelievably delicious. Finally, a Gluten-Free crust! 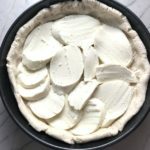 Fresh mozzarella has more moisture than processed shredded mozzarella, therefore, the best way to avoid this moisture from oozing out into the pizza is to slice the mozzarella 1 hour ahead (you can do this the night before) and lay it layered in paper towels to soak up the excess moisture. Add the Ground Turkey to a large mixing bowl. To the turkey, add the minced garlic, 3 Tbls of the chopped parsley (save 1 tbls for garnish), 1 tsp of fennel seed, 1 tsp Salt, 1/2 tsp fresh ground pepper. Spray a 8-9″ round pan with Olive Oil cooking spray or rub with Extra Virgin Olive Oil. 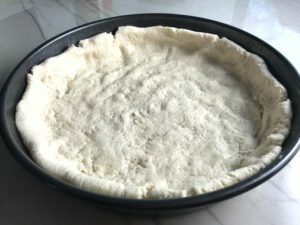 Place the dough in the center of the pan and press it out to cover the bottom and then up the sides, making sure to pinch any holes back together. Next, layer the de-moisturized mozz all over the bottom. Layer the turkey Italian Sausage. Completely cover the cheese in a single layer. 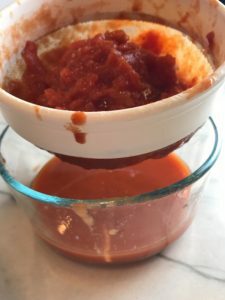 Put a strainer over a bowl and squeeze and mash the whole tomatoes in your hands over the strainer keeping big chunks of tomato in the strainer and allowing all of the excess liquid to fall through into the bowl. 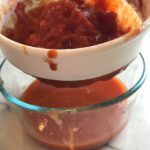 Make sure that you really strain the liquid out so that it doesn’t make the pizza soggy.